1. A new bag. A bunch of bags are on my radar right now, which is funny because I’m very picky about handbags and don’t actually buy them that often. The one pictured above was my major splurge piece for the year—can you believe I found in on sale? The ones I’m lusting after right now are much more affordable—the problem is I want them ALL. I recently bought the Cult Gaia Luna bag and I love it (I purchased mine when I posted it as the Deal of the Day). I’m also waiting for the Staud Clothing Shirley bag to arrive (it’s currently sold out again but you can ask to be notified when it comes back in stock; that’s what I did about a week ago and received an email within days). But I also really love the Staud Moreau macrame and leather bucket bag. It’s so different and fun. 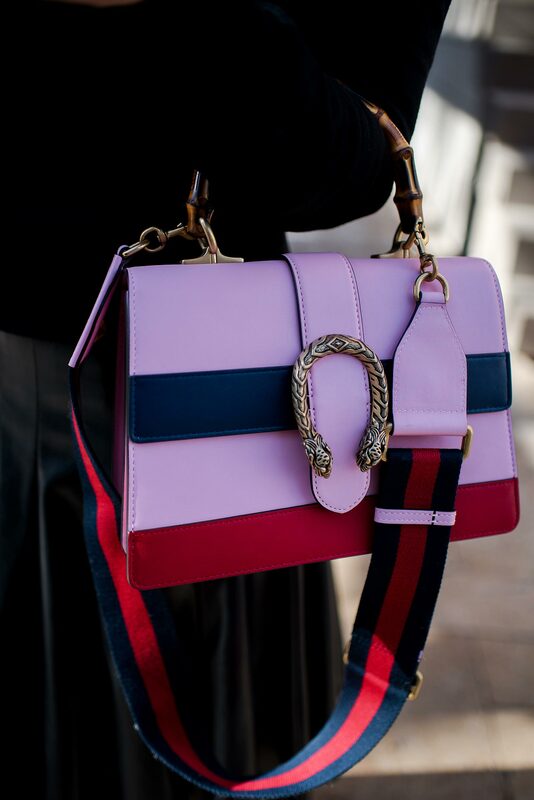 And then there’s the stunning pink Cult Gaia top handle bag (below), which is no longer available for pre-order from Moda Operandi and I want to cry because it is unlike anything I have ever seen. I’m hoping it comes back in stock somehow and I’m able to get it. You can find more fab bags in the Resort Ready piece. 2. All the spring and Easter things. I have a six-year-old and go all out decorating for every season/holiday. Truth: I am the real six-year-old and go all out decorating for every season/holiday. Here are a few things we’re decorating with this month. The little bunnies from Target are darling—I bought some for Alexandria and her cousins—and the pink rug by Threshold is beautiful—I have it in my kitchen. I also bought the glassware below. 3. The new Barbie dolls. My daughter wants Walt Disney to “fix their movies.” She only likes princesses “if they are real” and doesn’t understand why Sleeping Beauty “has to be asleep for one thousand years and have a prince come wake her up.” One of her favorite bedtime reads is this book Good Night Stories for Rebel Girls and she is working on a biography of Queen Victoria for her school project. Needless to say, I think she will love the Barbie Inspiring Women dolls. 4. All the TV time. One my favorite shows, The Americans, premiers on March 28 for the final season. 5. A fresh pair of kicks. I’d love a pair of colorful kicks for spring and these are the all the ones I’m eyeing. 6. New laws. I plan to join the march to protest gun violence on March 24 here in Chicago. Find a march near you here.